Ellis’ opinion started with an extended discussion about the legal landscape surrounding the appointment of special prosecutors. 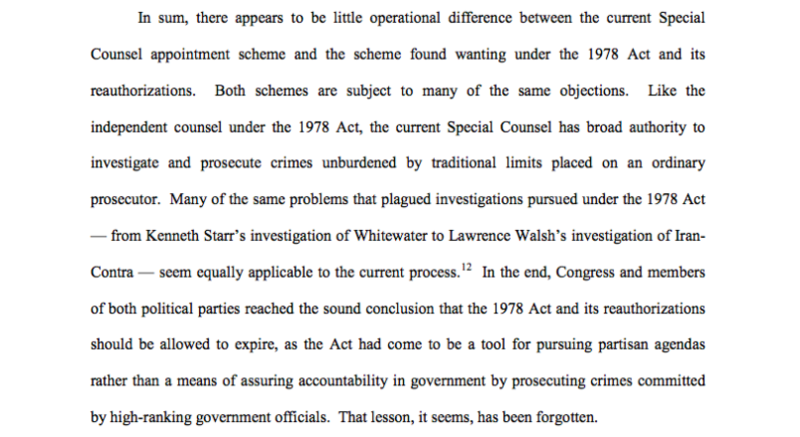 Ellis did not stop with the issues he had with special counsel regulations in general. Moving on to the details of the current matter of him, the judge speculated in a footnote that Mueller’s prosecution of Manafort is part of “larger plan” to put pressure on President Trump. Such tactics are “neither uncommon nor illegal,” but “they are distasteful,” Ellis said. The judge addressed other arguments that Manafort made during the proceedings that another line in the Mueller appointment order — which puts in the special counsel’s purview “any matters that arose or may arise directly from the investigation — is too broad. Ellis said that this question was “close” and one where Manafort’s arguments had “merit,” but ultimately decided that it was not an issue he needed to resolve. Even still, he found room to levy a few more criticism of the current special counsel system.